The SSM had its first field trip on November 3rd, 1987 to an area north of Hodgson, Manitoba. Though there were 2 feet of snow on the ground, the group managed to discover the largest bat hibernaculum in Manitoba, a record that still holds. Later that winter, in January 1988 the society had its first meeting, and established itself as a formal organization under the name of Speleological Society of Manitoba. Since then, the SSM has investigated hundreds of square kilometres in several distinct karst areas of Manitoba. Through the analysis of air photos, and exploration on foot, over 225 caves have been recorded, many of which were featured in a cave atlas published by the SSM in 1991, with a revised edition in 2000. The SSM also established the first Manitoba newsletter for Manitoba cavers, Speleonews, which keeps members up to date with caving news in Manitoba and around the world. Other endeavours of the SSM include leading caving trips for young people, from Boy Scouts to Eco Odyssey groups, and helping introduce them to the outdoors. The conservation of caves and karst in Manitoba has, and continues to be, an important facet of the organization, and our members have been vocal about the need for the protection of caves. They have been instrumental in the designation of the first cave ecological reserve in Manitoba (Lake St. George Caves Ecological Reserve) in 1997 and a second (Walter Cook Uplands Caves Park Reserve) in 2001. From the first haphazard outings the group has worked to establish safe caving procedures which have included stewardship of newcomers, purchase of approved equipment, climbing and first aid skills, and rabies immunizations. By these means, the SSM has established caving as a safe recreational activity. Our latest projects focus on community outreach and exploring new, uncharted areas. In the last number of years we have worked to increase public awareness and our accessibility in hopes of finding a new source of cave locations: people. Therefore, if you know of any caves in Manitoba, please let us know. To promote safe recreational caving in Manitoba. To protect Manitoba's caves and their natural contents. 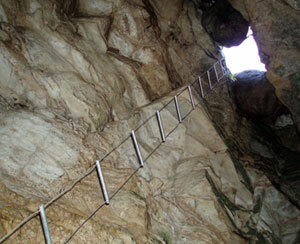 To foster an awareness of and appreciation for Manitoba's speleological features. To advance by any and all means the study and science of speleology in Manitoba.